YouTube engineers prepare the new subscription plan. 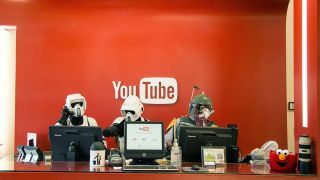 Now it seems that the time is right for a full-scale launch: Re/code reports that "content owners" (the YouTube professionals) have been told by Google to prepare for an "ads-free version" of YouTube, "available to fans for a monthly fee". There's no mention of a date but industry insiders say the end of October is a safe bet. We may well hear more about the new premium subscription plan at the Nexus event on Tuesday. If reports are to be believed, this new ads-free option will be rolled into YouTube Music Key which is already part of Google Play All Access. In other words, sign up for one and you get the others thrown in for your US$9.99 (or £9.99) per month. YouTube Music Key removes ads from music videos and lets you play them in the background on mobile devices. It sounds like this new option would remove all advertising from the site completely. It may feel like YouTube is peppered with ads but the portal doesn't actually make much money for Google, despite its immense popularity. Google itself would probably be fine with that - the company isn't short of cash - but it's under pressure from publishers to increase revenue.